Boss amps have been making some serious waves in the guitar industry over the last few years and they’re pioneering new ways to make guitar amps too. Their solid state amps have been blurring the line between tube and solid state amps by giving valve amps a serious run for their money and have shown no signs of slowing down. We take a look at the key differences in their current amp line between the Boss Katana, Roland Blues Cube and the new Boss Nextone (pronounced Nex-tone) solid state amplifier. The Blues Cube, Katana and Nextone amps are all aimed at quite different players and all offer something unique. None of them are tube amps which seems a strange thing to say in a guitar world dominated by vintage and boutique style tube amps but these 3 different models all hold their own in a unique way and prove that rules were made to be broken. The Boss Nextone is a perfect example of this by packing Four Analog Class-AB Power Amp Circuits all into a single unit – something that hasn’t been done before. This allows you total tonal and creative control over your amp sound. There’s no denying the success of the Boss Katana range either as it hit the perfect sweet spot between having loads of great features, being really affordable and working as both a gigging amp and a home practice or recording amp. Then you’ve got the Blues Cube which was released under Roland (Roland and Boss are part of the same company if you weren’t sure of the parallels there) and the Blues Cube was a hit with players who wanted an affordable, powerful, giggable amp that could be attenuated, that maintained real “feel and response” without having to lug a heavy valve amp around. The Boss Nextone amps are a new take on a classic design. Normally you’d only ever have one power amp and you’re stuck with that voicing. However, Boss have cleverly added 4 analogue power amps into this unit that’ll allow you to choose your exact sound and response from the amp. You’ve 6V6 for American combo cleans and 6L6 for higher headroom, cleaner tones that American sound with more gain. Or EL84 for glassy, chimey British sounds or even EL34 for classic British distortion. The power amps are class A/B which means they’ve got equivalent valve power according to their wattage. So, the 40w Nextone amp will hold it’s own next to a Fender Hot Rod Deluxe, however it has got attenuation which will take it from 40w to 20w to 0.5w! This not only adjusts output volume, but it also changes the amps response to that of a lower powered amp. Having this flexibility in the power amp section allows you to completely control how the speaker breaks up under distortion and also how your amp responds to your pedals. You can even dial in two different channels with two different power amps using the Nextone editor allowing 6V6 for clean and EL34 for lead for example. 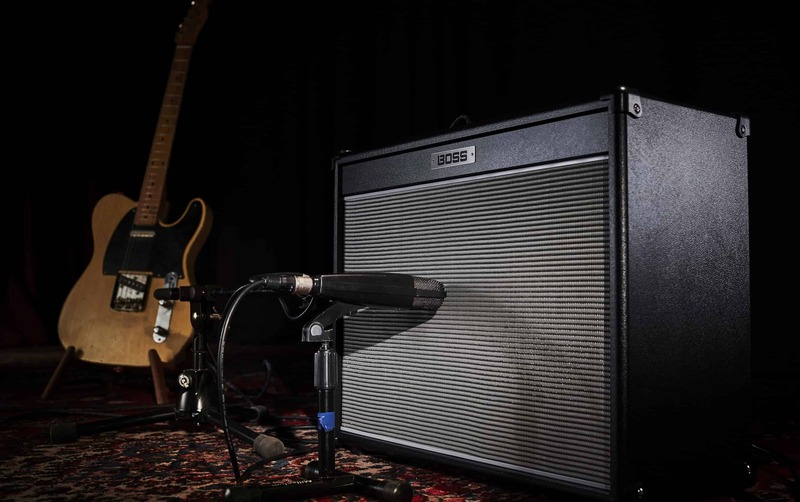 The Boss Nextone amps are great for when you want total control over your sound and exactly how the speaker responds to what you’re playing and what you put in front of it. I wouldn’t be surprised to see these amps on stages all around the world in a similar way to other 40w valve amps, except without the tube amp vulnerability issues. Boss products are built like tanks! The Boss Katana range is quite vast and goes from their Katana Air mini practice amp up to Katana Artist which is a fully-fledged Solid State amp with a powerful suite of effects and everything you’d need to get gigging. The Katana range also features a single Class A/B power amp we incredible, dynamic response and feel. The Katana 50 and Katana 100 have also sold brilliantly as they are affordable solid state amps with digital effects on-board. There are up to 55 customisable effects based on Boss pedals and you can store multiple presets with 3 effects on at the same time if necessary. I own a Katana 50 myself and it’s a brilliant way to get great tones at home for practising but at 50w is also loud enough to rehearse with and the recording function is nifty too. The Katana amps great for when you want loads of effects and sounds in a single unit and aren’t too worried about using pedals for effects or too worried about honing or crafting your sound. They make it easy to just get great sounds and there’s a good reason for these amps dominating the amp scene of late. Katana Artist features Tube Logic design approach found on Boss Nextone and Roland Blues Cube and all Katana’s (except Mini and Air) feature a Class AB power amp. The Roland Blues Cube sings with some of the best blues combos out there! It’s a Solid State design and when it first came out was compared to another famous Roland Solid State amp, the Jazz Chorus. They’re quite different amps however as the Blues Cube was the first to introduce Tube Logic which allowed it to emulate the sound and feel of different valves. The Blues Cube has also got nifty ‘Tone Capsules’ which can be attached to the amp to completely transform and overhaul the sound. Players like Eric Johnson have even had their own signature Tone Capsule and used the Blues Cube. You know it’s a good amp when players with such impeccable and specific taste like EJ use it. The Blues Cube aimed to replace valves with a solid state circuit instead and it worked perfectly. These amps are also attenuable meaning you can cut the power down for use at lower volumes. You get 2 channels (clean and crunch) with a powerful 3 band EQ, Presence, Boost, Tone and Master Volume. Combine that high-quality reverb and tremolo, extensive power output options and lots of control from an optional extra footswitch and you get the picture! The Blues Cube is great for traditional players who want a lightweight alternative to their favourite tube combo. Perfect with pedals and offers open, warm tones. Great with both single coils and humbuckers. Responsive and dynamic with independent clean and crunch channels with a dual tone mode for blending channels. Efficient and lightweight design meaning you don’t have to break your back carrying a heavy valve combo anymore! All 3 amp ranges are aimed at quite different players but would actually suit most players in some way, shape or form. It all depends on what you want to get out of the amp. At their price point, they’re very competitive and you get amps that are chock-full of features. All of them are capable of recording via USB too which means you have no excuse to not get those brilliant licks and ideas down! Well, what are you waiting for? Go and grab a Boss Nextone. Or Boss Katana. Or Roland Blues Cube. Now.